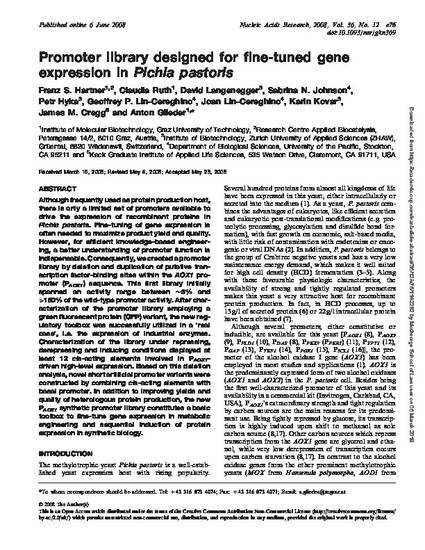 Although frequently used as protein production host, there is only a limited set of promoters available to drive the expression of recombinant proteins in Pichia pastoris. Fine-tuning of gene expression is often needed to maximize product yield and quality. However, for efficient knowledge-based engineering, a better understanding of promoter function is indispensable. Consequently, we created a promoter library by deletion and duplication of putative transcription factor-binding sites within the AOX1 promoter (PAOX1) sequence. This first library initially spanned an activity range between ∼6% and >160% of the wild-type promoter activity. After characterization of the promoter library employing a green fluorescent protein (GFP) variant, the new regulatory toolbox was successfully utilized in a ‘real case’, i.e. the expression of industrial enzymes. Characterization of the library under repressing, derepressing and inducing conditions displayed at least 12 cis-acting elements involved in PAOX1-driven high-level expression. Based on this deletion analysis, novel short artificial promoter variants were constructed by combining cis-acting elements with basal promoter. In addition to improving yields and quality of heterologous protein production, the new PAOX1 synthetic promoter library constitutes a basic toolbox to fine-tune gene expression in metabolic engineering and sequential induction of protein expression in synthetic biology. Originally published in Nucleic Acids Research, click here to view the article on the journal's website.